I have nothing but good things to say about the Fake Bake Flawless Darker self tanner spray. This tanning spray is a good indication of how far tanning products have come over the years. It does what it’s supposed to do, effectively and easily with minimal side effects. 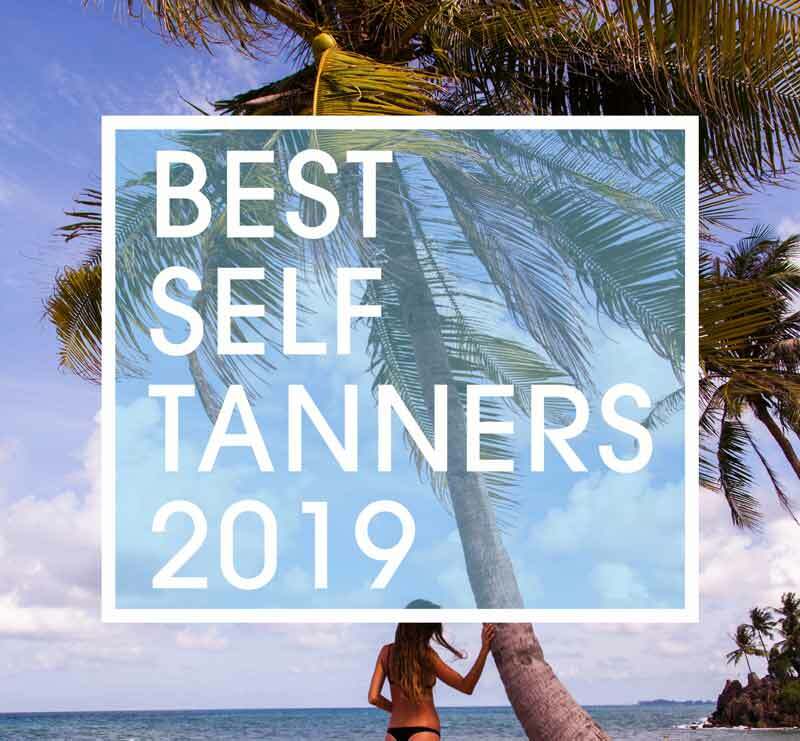 With other self-tanning products, customers will always be wary about arriving at an orangey looking complexion, unsightly blotchiness, and unevenness, as well as subsequent adverse skin reaction. With fake bake, these symptoms are near mythical. It is formulated for sensitive skin and as such, is good for use on the face. I use Fake Bake Flawless Darker all over my body with no problems. It gives me a terrific looking tan color within minutes, however, it takes 4 -6 hours to develop and darken your complexion. Application time may vary with individuals and their particular skill-set, but I find that using the tanning mitten gets the job done quickly. Spray a substantial portion of the tanner on the pink side of the mitten (i.e. is enclosed) and in a massaging manner; rub the tanning solution onto your skin. The mixture is of a light brown color and serves as a guide when applying it. You can observe how the solutions spread over your body and can see if you missed a spot or need to blend and even out the color. For jointed areas such as your elbows, knees, and ankles simply bend and flex those body parts when rubbing in the solution. 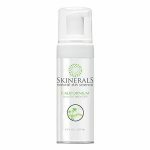 For the best results, it’s important to prep your skin before applying this self-tanning spray. I usually shower and exfoliate my skin first before application, but another important step is to moisturize. This can be tricky, however; you don’t want to apply any kind of moisturizing lotion or oils right before using Fake Bake Flawless Darker self-tanner. 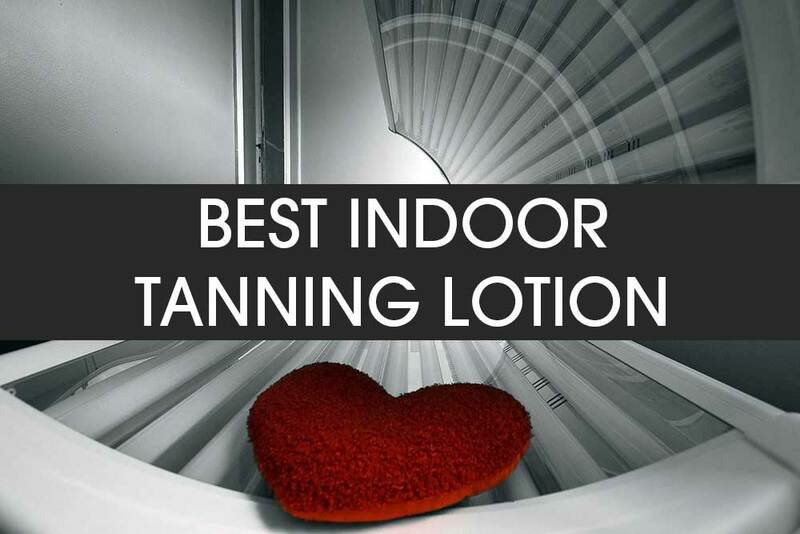 This creates a barrier between the tanning solution and your skin, preventing it from properly penetrating the area and will affect how it dries on your skin. Nevertheless, your skin needs to be healthy and moisturized to obtain the best-looking tan. My advice is to moisturize consecutively for a couple days before you plan on self-tanning. Once you bathe and exfoliate, apply the self tanner and allow it to dry properly for up to 6 hours before attempting to moisturize again – and then continue to do so as you please in the aftermath. You don’t have to wait an entire 6 or so hours for drying time. Even though it is water resistant, it’s just best advised to wait this long before going swimming, or applying other cosmetic lotions etc. as well as showering. Try to shower and wash off the brown coating the tanning spray leaves on your skin before wearing white and light colored clothing so none of the tanner transfers unto these fabric. 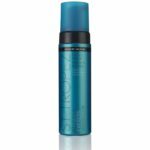 This tanning spray is non-sticky/non-greasy, relatively light in consistency, fast absorbing and as such, dries pretty quickly. It takes about 10 minutes to dry and then you can be on your way. You can feel how the Fake Bake Flawless Darker self tanner dries on your skin to gauge the rest of your activities for the day. It dries leaving my skin smooth and soft and more impressively, looking glowingly bronzed. It doesn’t matter what skin tone you are and for what reason you chose to get tanned or darker, Fake Bakes works with every skin color. Their exclusive sunless formula combines Dihydroxyacetone (DHA), DMI, and Erythulose to produce a safe, long-lasting and golden tan. This precise mixture enhances your skin’s pigments to deliver a very natural-looking skin color. Users can determine how light or dark they want to be when using this self tanner. In my experience, one application delivers complexion that is perhaps two shades darker than my usual color, which is perfect for me. However, you can decide if you want to get darker and continue doing more applications along the way until you have found what color suits you. 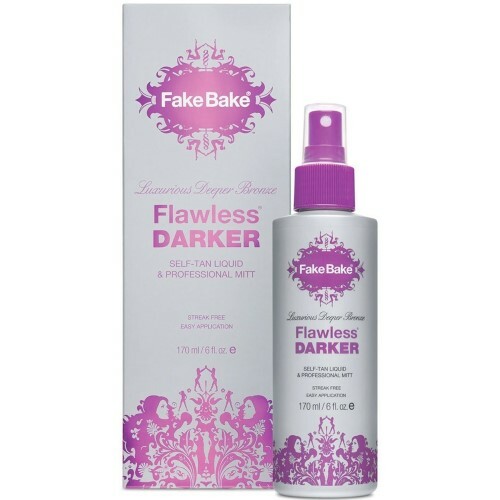 Fake Bake Flawless Darker self-tanner has a tropical coconut scent when you smell it from the bottle and during the first few minutes of application. But the smell seems to wear off once it dries and especially after you shower. You can expect a bottle of 6 ounces to last you about a month, but this all depends on how often you use it and how much you use each time. While some people only tan their extremities for show, others do full body tans. I like the Fake Bake Flawless Darker self-tanner bottle; it is a gray/silver color bottle with a fuchsia pink spray cap dispenser. The designs and text are of the same fuchsia color, which gives the overall bottle a pop. The packaging box is white with the ‘Flawless Darker’ name printed in fuchsia as well as the Fake Bake logo at the top. The only problem I have with Fake Bake Flawless Darker is their design choice of the bottle cap dispenser. During the process of applying the tanning solution, the dispenser is a bit bothersome to press as you go along. Perhaps if it had a wider surface area and easier pumping resistance it would have scooped slightly higher. The pump combined with the scent that only lasts a short time means it gets a 4 out of 5 instead. So in retrospect, the actual tanning solution is simply perfect and is one of the best self-tanning sprays you can find on the market today. So I suggest giving it a try on your quest to finding a long lasting, natural looking skin tone.